Who has red-orange eyes? Whose flight feathers are tipped in white? Who has a specked light brown necklace just like her mother’s? And who has grown bigger and stronger than both of her parents? Hello Tweedy. It’s nice of you to stop by. 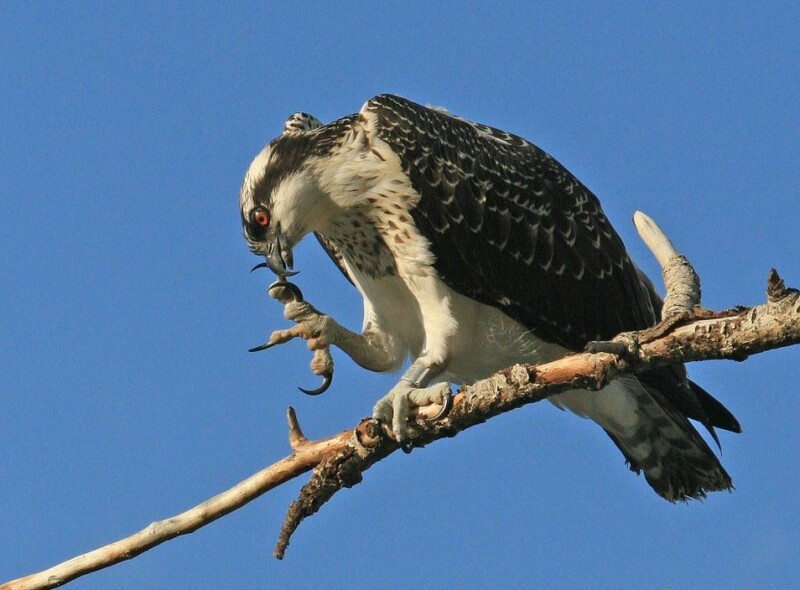 Tweedy was picking her beak after a snack of speckled trout. She caught it on her first dive and wanted her mother to know. She is a fully grown young adult with powerful wings and her Dad’s instinctive fishing abilities. Tweedy, like her mother, is an independent thinker. She considers the hurricane a natural part of her life. She mostly came by to assuage the Doctor’s anxiety over her state of well-being. The Doctor appreciates it very much. Does not she look good? Those young male chicks in South America will have their wings full. Her talons really turn the Doctor on. Tweedy is alive. This happy affirmation found a comfortable spot in the Doctor’s prefrontal cortex and is contented. Oh yes! Raptor I am.